LENKENG 1 in 4 Out HDMI Extender. 1x HDMI in to 4x RJ45 out. 4x Receivers Included. Supports 1080@60Hz over Cat6 for up to 40m. Remote power receivers from transmitter. With local HDMI out. 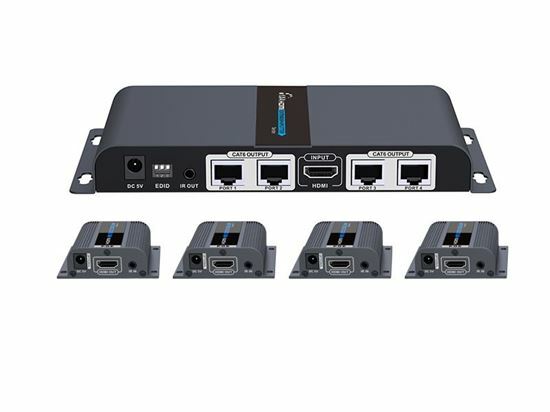 This HDMI extender/splitter works with 4x HDMI Cat6 extender/receivers. Can split and/or extend from 1x HDMI source to 4x HDMI displays over a single Cat6/6a cable for up to 40m/131ft. The highest resolution supported is 1920x1080@60Hz. It also supports IR passback and EDID pass through. Ideal solution for HDMI exhibitions, video conferences and show centres etc. Distributes 1x HDMI source to 4x HDMI displays over network cable simultaneously.